Helen Niskala was born July 26, 1929 in North Bay, Ontario, and attended Jarvis Collegiate in Toronto. 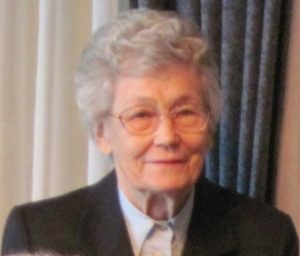 She graduated with a Diploma in Nursing from Toronto Western Hospital in 1951, where she worked from 1952 to 1957. She spent the 1957-58 year at the National Hospital for Nervous Diseases in London, England, as a post-graduate student. From 1958-1963 she was an Auxiliary Medical Nurse for the Royal Canadian Air Force while working at the Ottawa Civic Hospital. She graduated from McGill University with a BN in 1964. This was followed by a move to the University of British Columbia where she was a clinical instructor from 1964 to 1968. She was later employed by the School of Nursing at the University of Alberta from 1972-1975, and served as Director of Education Services in Coquitlam for the Registered Psychiatric Nurses Association of BC. She recommenced employment at UBC in 1982, where her special research interests have included treatment of adults and the elderly with long term health problems, particularly in community settings. Her teaching responsibilities included Advanced Nursing Care, Guided Study in Nursing, Clinical Specialization I and II, Teaching in Clinical Nursing, and Nursing and the Delivery of Health Care. She also worked as a consultant on numerous projects and was active in research and publication. Series consists of records relating to Dr. Niskala’s education and teaching/research career, including a detailed cv. Essays she wrote and notes prepared as a student at university, and certificates she received for both academic work and other activities document her early life. Course outlines and other materials document her teaching at the University of Toronto and the University of British Columbia. Her extensive research interests are documented in copies of numerous papers she prepared for publications and presentations at conferences. These include drafts, correspondence and reference material. Many relate to her treatment of people with illnesses with a view to their remaining in the community. Titles include “Conflicting Convictions: Nurses in Forensic Settings”, “Real Life Problems and the Home Hemodialysis Patient”,”Competencies Valid for Community Psychiatric and Nursing Practice”, and a number of papers on community cardiac care.